We are a small family-kennel based in Sweden, our interests in this breed began in 1999. 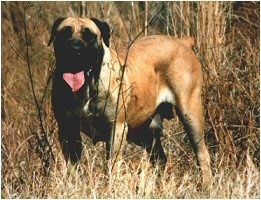 To find the original type of boerboels was quite difficult at that time, we found the "Ysterberg" dogs in Africa and imported our male "Samson" from there. We realised that this dog was one of a kind, in fact the only pure ysterberg-dog in whole Europe then ! I attended the Sabt breeders course in 2004, i got my breeders diploma and learned a loot about boerboels and breeding boerboels . 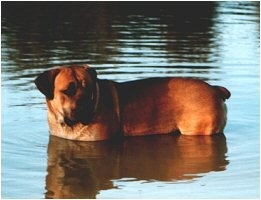 In 2005 we found our Samson a suited wife in USA ,Viola from "oakview boerboels" she is also strong ysterberg related in her pedigree . So far we have done two litters with them ,we have kept several dogs from these litters, in 2010 we did a litter on the daughter (benja) with a male from Africa we borrowed from Stoffel Bloom (Mouzer-ysterberg Boerboels) . And in 2011 we did one more litter on Benja, this time with a male coming from Sandaharr in Scotland, again a strong Ysterberg related male. Also in 2011 we mated our old female Viola with her grandson from the first Benja litter, this gave us the females Emma and Ella. Then in 2013 we breed Duller, the female from the sandaharr male we used ,to her uncle "Bones" ,this was done in attempt to secure the best genetics comming down from the Samson/Viola beginning. 2013 was the year where we made friends with a kennel on the other side of the world ,Dreamtime Boerboels who also work with ysterberg dogs ,we have high hopes for this cooperation .